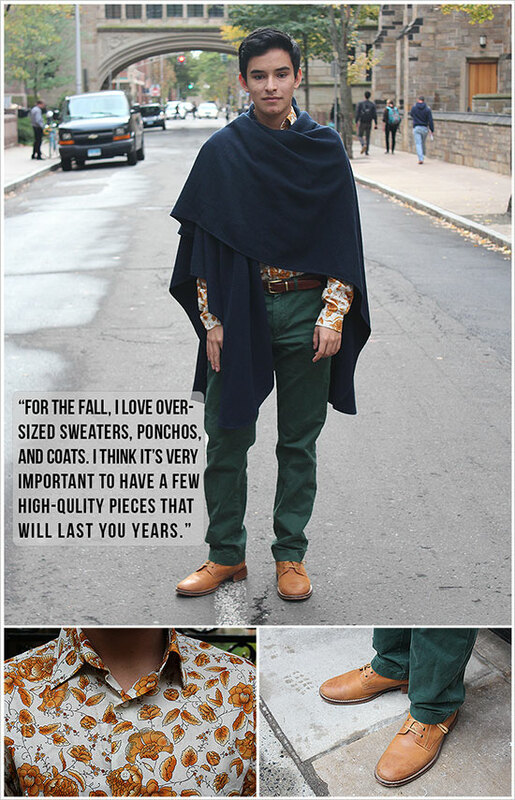 Here in New Haven we find ourselves in the midst of fall and thus the eternal struggle to dress stylishly and comfortably plagues us again. 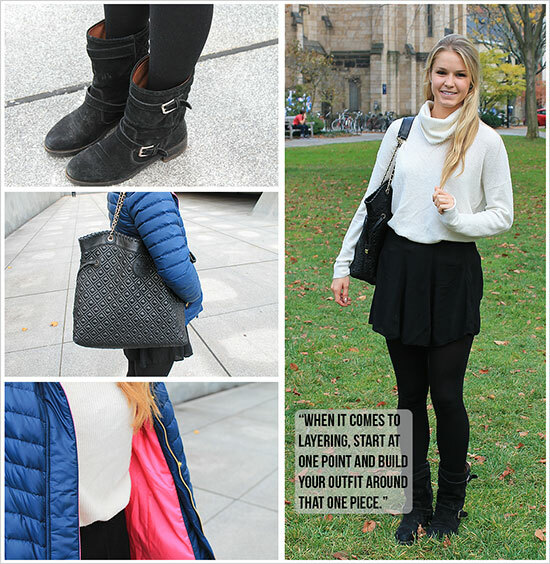 Taking some cues from some of the most fashion savvy students on campus, The Boola presents a complete guide to dressing for the fall, without having to sacrifice your comfort. Fuzzy Cardigan: The cardigan is everyone’s go-to staple for the fall. However, having a wardrobe of the same exact sweaters in different shades can feel as redundant as a cartoon character’s signature ensemble. Switch it up with different textures that will give your outfits new dimensions. Vibrant Outerwear: It’s pretty easy to get lost in a sea of of cool and neutral shades in the Fall. 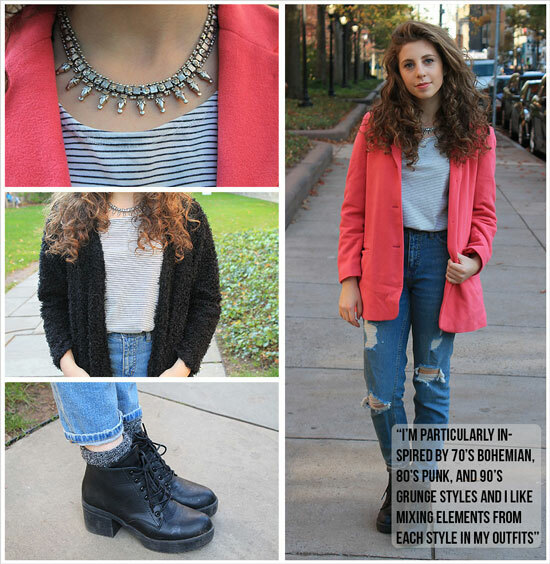 Nothing sets you apart like a pop of color- especially when it comes to outerwear. Choosing a bold piece to center a mostly black-and-white outfit around really creates a cool contrast and well-put together look. 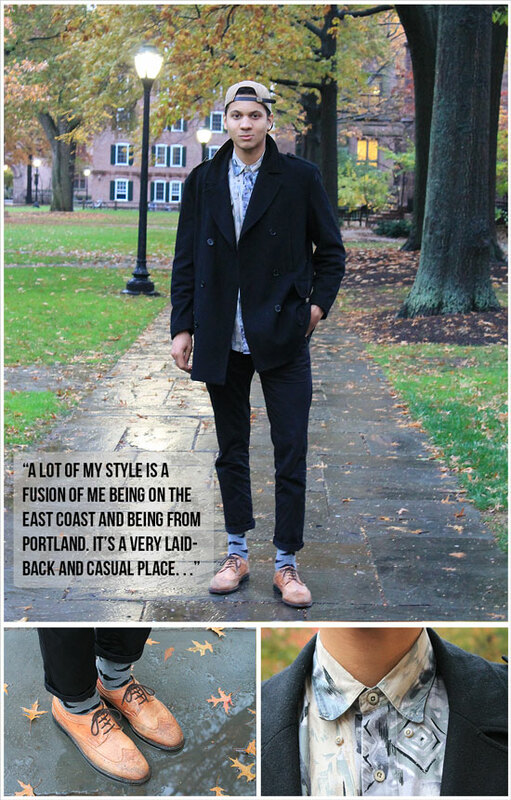 Classic Coat: One really can’t go wrong with a classic peacoat. As long as it keeps you warm, it’s a go-to that will probably never fail you. Funky Patterns: Wearing a pea coat is great, but if you’re gonna keep outerwear simple, add some fresh pattern to spice up an otherwise monotone outfit. Color Coordination: One doesn’t always want to match the gloominess of the leaf-covered, grey sidewalks of New Haven, but it’s hard to pull off bold and bright colors. Go with cool and eclectic tones that balance each other out. The forest green of Jonathan’s pants and the navy blue of his poncho compliment each other, while the vibrant orange of his patterned shirt lies on the opposite end of the color spectrum, balancing everything out. 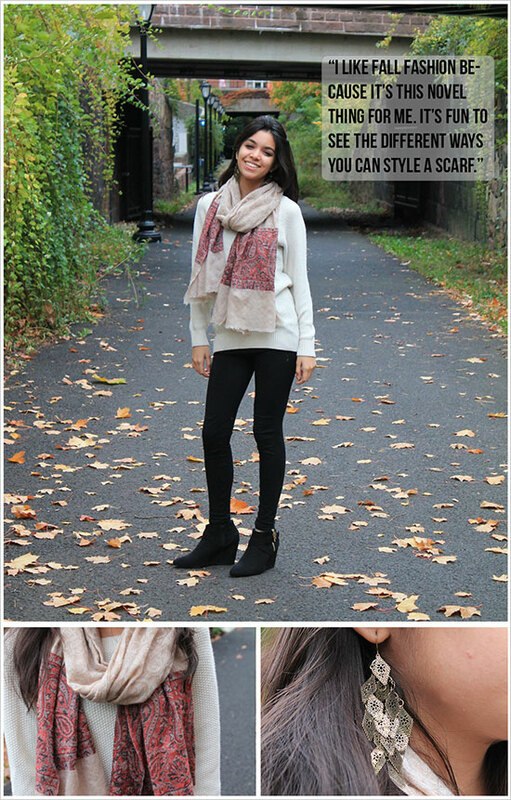 Scarves: It’s fall- you literally cannot go wrong with throwing on a scarf and calling it a day. Scarves are perhaps fall’s best accessory, providing warmth from the icy wind chill as well style. You can find scarves in so many different styles, such as Meiryum’s paisley one. Infinity scarves also keep you cute and comfy. Classic Fall Sweater: Guys simply can’t go wrong with a classic fall sweater. 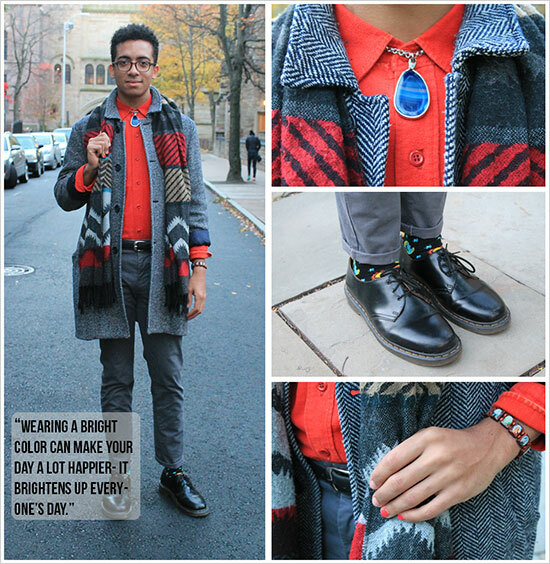 Create a put-together look with a collared shirt underneath. To mix up this classic look, add a pattern or unconventional color combo. Dark Wash Jeans: Save those faded light blue jeans for another time of the year. 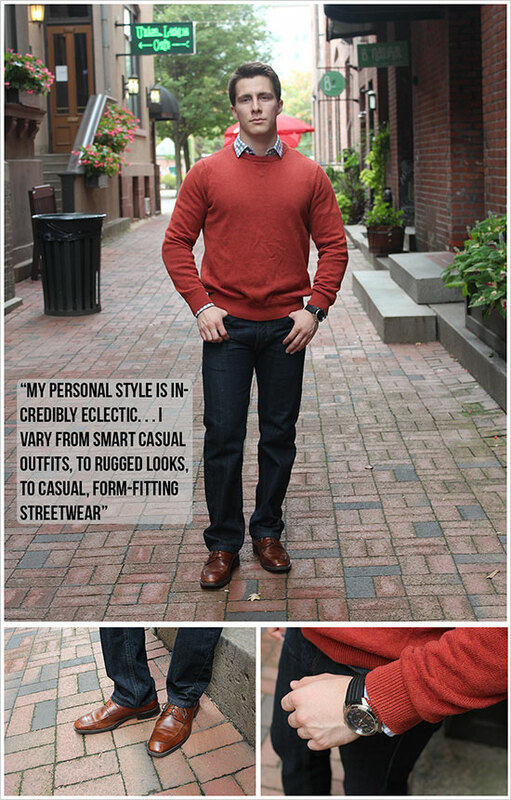 A pair of nice, dark wash jeans are absolute staples for menswear, especially in the colder times of the year. Cowl-neck Sweaters: These are perfect for the fall when you’re not quite ready to commit to the neck-stiflingness of a turtleneck, but still want to keep warm and toasty. A creme sweater is a classic touch that will never compromise on comfort or style. Skirts and Tights: It’s easy to adopt a uniform of leggings, jeans, and sweats, but fall can be a great season for skirts as well. With the perfect pair of tights, you can’t go wrong with a simple skater skirt. Cotton ones are great for keeping you warm without being too itchy. Tailor-made: This fall, ditch the baggy sweaters and slouchy tees, and go for a much more structured look. From cuffed sleeves to cuffed pants, the smallest touches can make your outfit so much more refined. Joel: “I love cuffing things… Clothes that are ready to wear aren’t really tailored at the end correctly, so cuffing them gives them a sleeker shape”. Art Imitates Life: Joel expertly creates a vibrant color scheme, contrasting dark greys and blacks with the vibrant oranges and yellows of the changing leaves. Adding a touch of blue brings the whole outfit together and creates a cool balance of colors that aren’t fighting against each other, but instead work together cohesively. 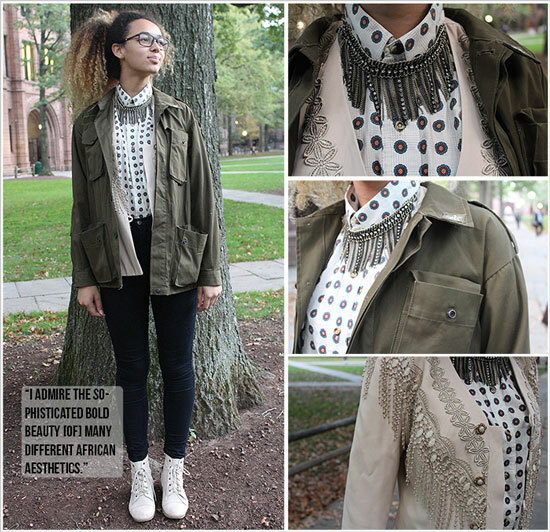 Military Jacket: It’s an edgy alternative to a classic peacoat and can almost go with anything. You can dress down a formal look and make it more laid back or take a really relaxed outfit and give a touch of effortless style. Touch of Vintage: Over Thanksgiving, take the time to raid your grandparents’ (or even parents’) old wardrobe to dig out some awesome throwbacks and vintage pieces or visit your local Goodwill Store. Liana’s vintage jacket adds another dimension to her outfit, with its intricate beaded fringe, dainty buttons, and sewing.